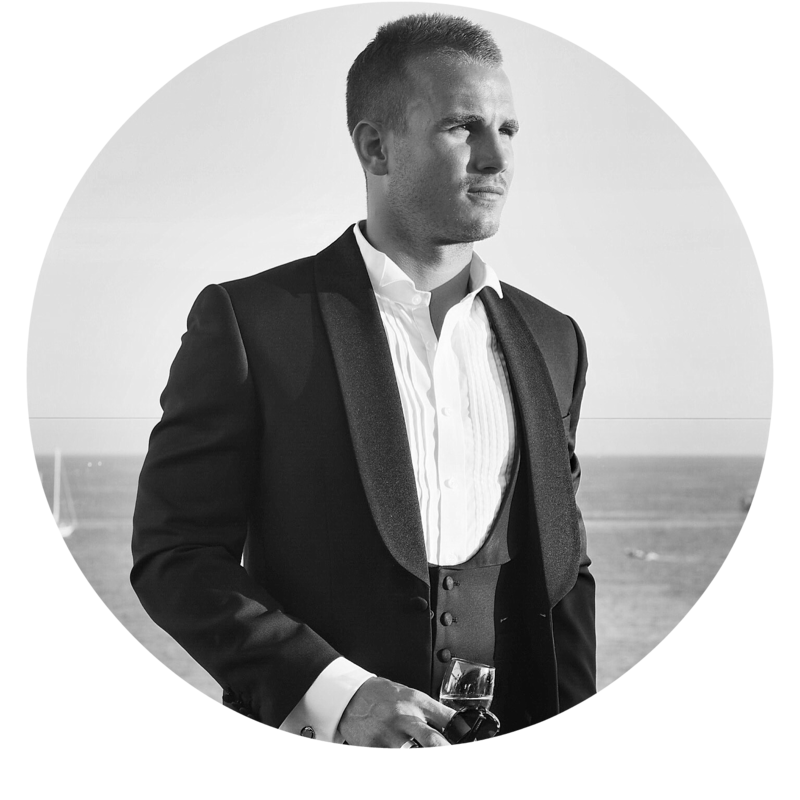 We are a generation in danger of burning out and with ultra early starts and longer working hours than ever before, we really need to find the time to ‘switch off’ and escape the pulls of social media and Gmail for an evening on the sofa. Both Josie and I have fairly hectic schedules and Weekend’s are often filled with working, so it’s more important than ever that we set aside some time to recuperate and relax, put our phones to one side and have a bit of a pamper. I play rugby on Saturdays, so typically Friday night’s for us are always pencilled in for a chilled pamper night and some indulgence. 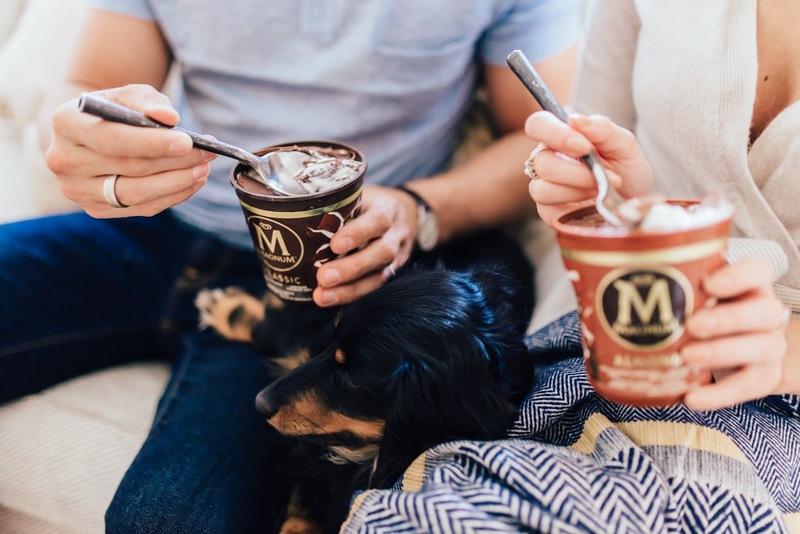 A great movie and some serious treats are just two of the crucial ingredients for the perfect night in. 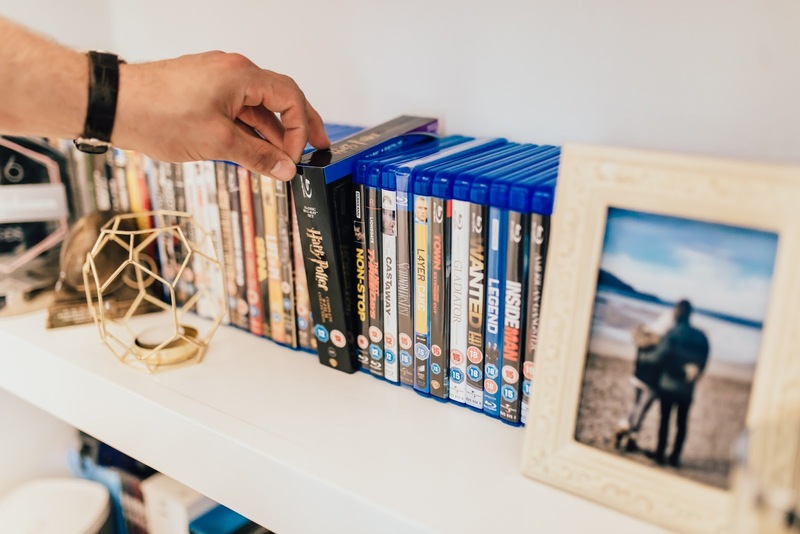 Film wise Netflix is always our first port of call before checking out my DVD collection – there’s something about a physical DVD that just feels that much better and I genuinely miss the Friday night trip to the local Blockbuster to peruse the aisles of new releases. 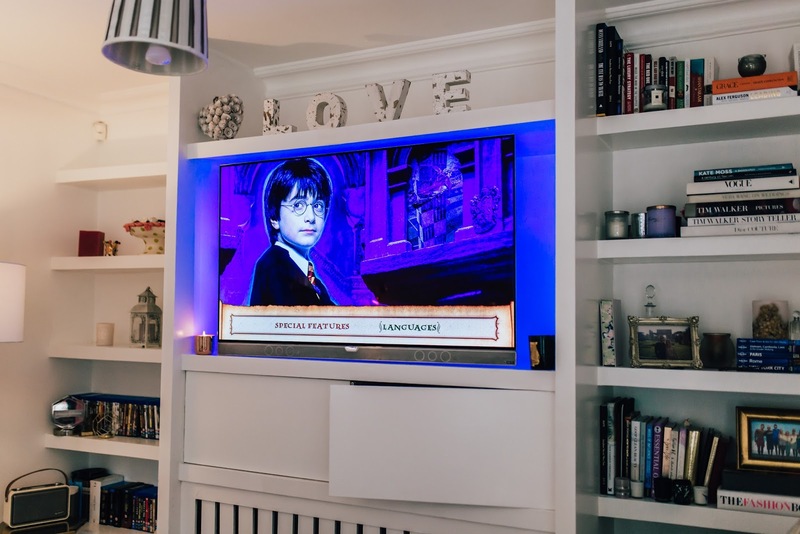 For this particular night in it was all about Harry Potter and reliving childhood memories of excitedly visiting the cinema to see the books brought to life. 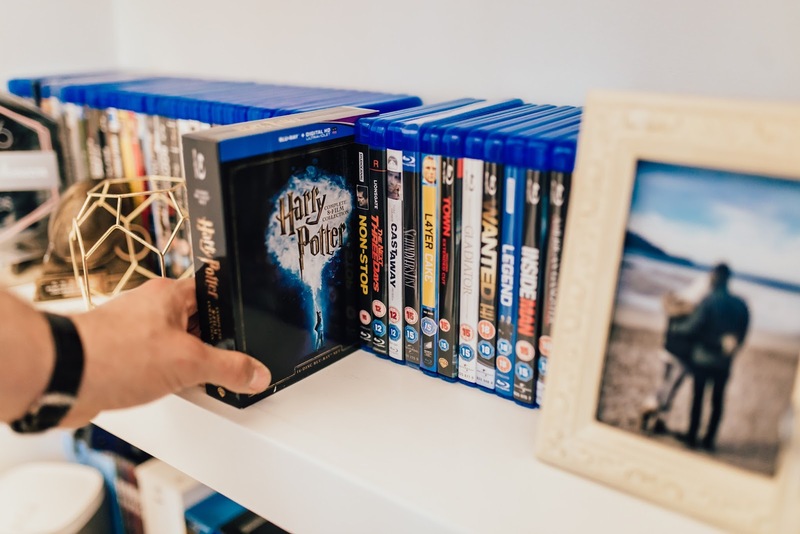 You simply can’t go wrong with a Harry Potter marathon! 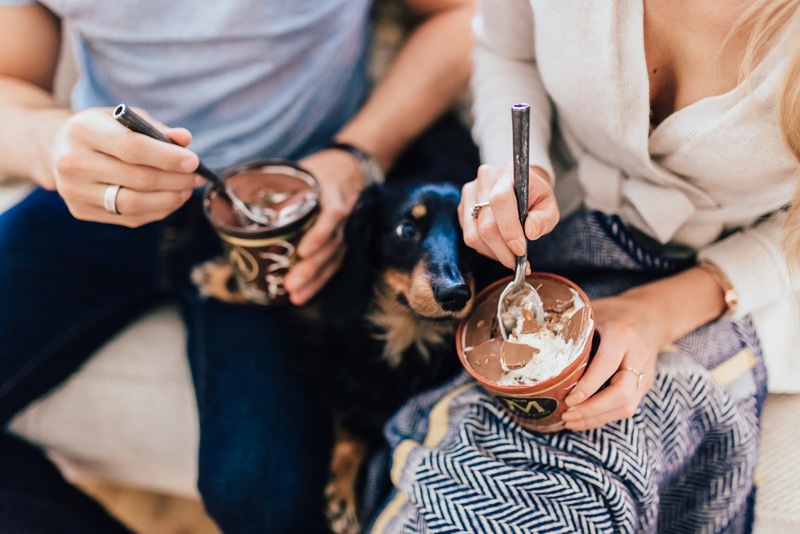 We eat fairly healthily in the week and so when Friday evening comes around it’s time to treat ourselves and call in the big guns for the ultimate indulgence. 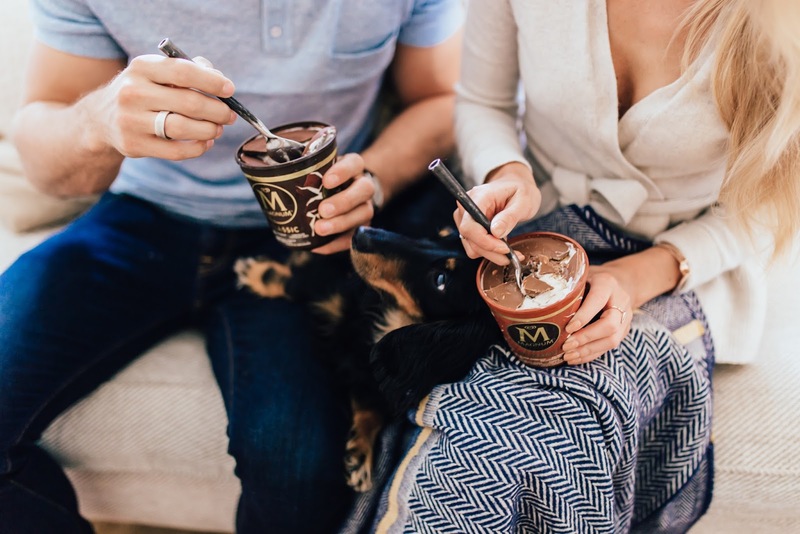 Ice cream has always been one of our go-to snacks and ice cream + a movie = pure happiness. When stood at an ice cream truck, Magnum has forever been my favourite brand and in particular the Almond or White Chocolate sticks of joy. 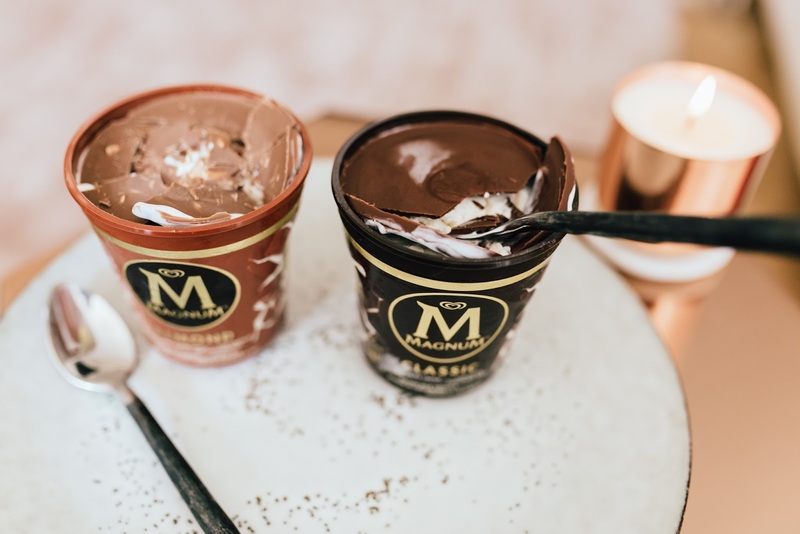 So having seen the recent release of the Magnum Tubs we had to give them a test run! 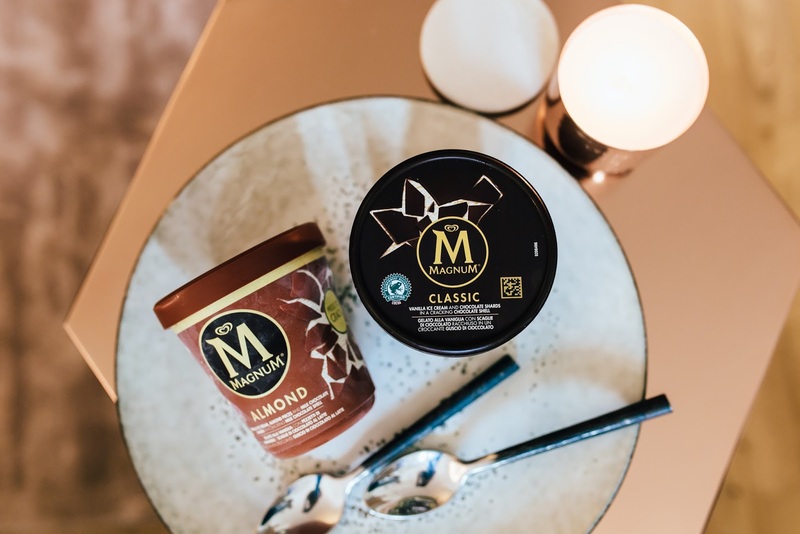 The tubs are designed to be ‘cracked’ with the ice cream wrapped in a shell of delicious chocolate, creating shard-like pieces of chocolate amongst the creamy vanilla base ice cream. After 10 minutes out of the freezer to warm up, it’s time to activate the dessert by squeezing the sides of the tub and cracking the chocolate casing. 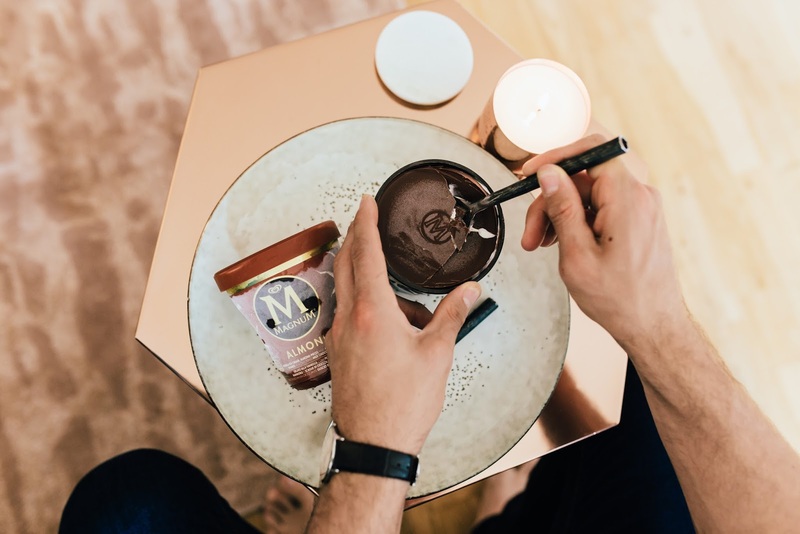 It’s safe to say the Magnum Tubs are the ultimate indulgence and the perfect accompaniment to a night putting your feet up and switching off. 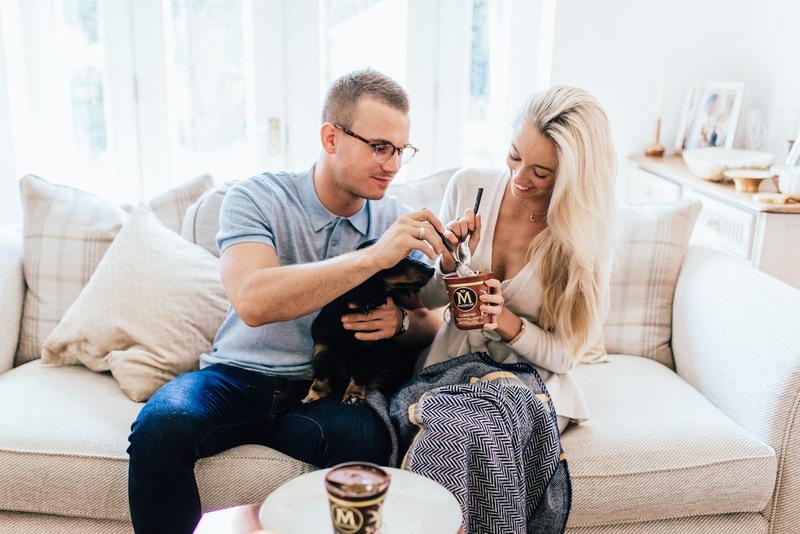 Ice cream has the power to turn around even the gloomiest of days and there’s something quite special about tucking into a tub with your loved one and sharing – although it’s unlikely you’ll want to share these! Despite our best efforts, Dexter got in on the action too…. What’s your ideal ‘night in’? 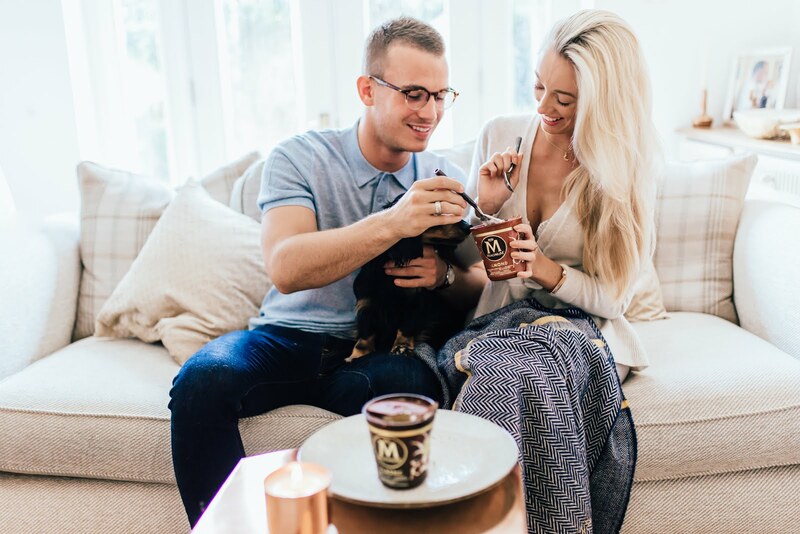 *This post was written in collaboration with Magnum, but my sheer love of Ice Cream is all my own! The perfect switch off night! Umm…what about Dickens? 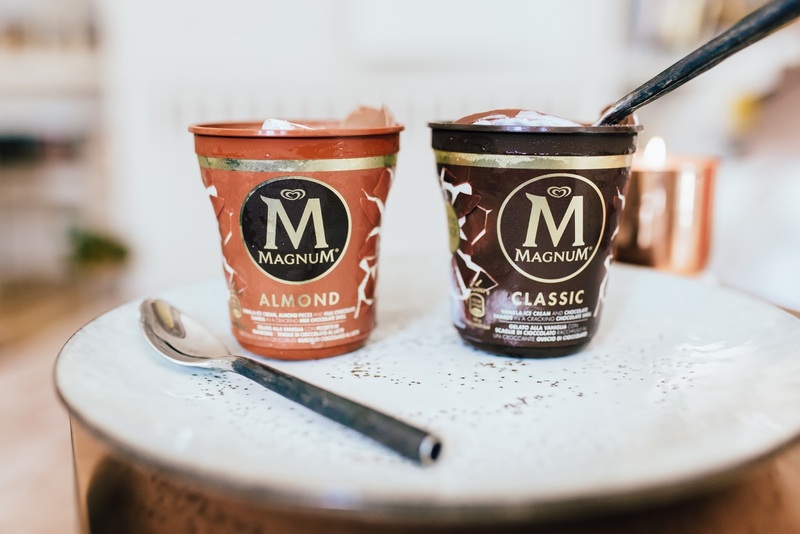 😉 The Magnum pots looks amazing! Those icecreams look amazing! Nothing better than switching off for a night. Really very helpful article post..